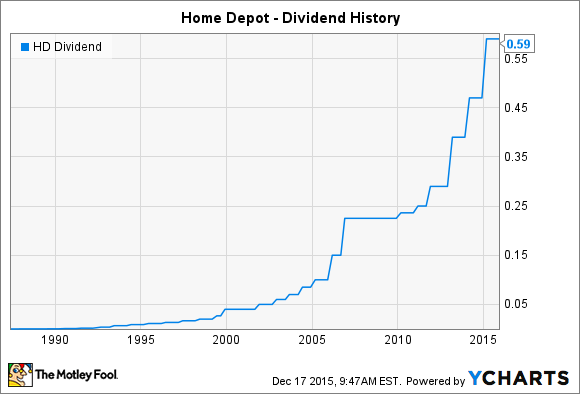 Will Home Depot, Inc. Raise Its Dividend in 2016? Investors want stocks that will reward them with higher payouts. Investors in Home Depot (NYSE:HD) have enjoyed monumental share-price appreciation over the long run, as the home-improvement giant has successfully tapped into a retail niche and made it into an empire. Successfully fending off archrival Lowe's (NYSE:LOW) and a host of smaller players, Home Depot has become the leader in the industry. It has also rewarded its shareholders with dividend payments, and while it hasn't approached Lowe's track record of more than half a century of annual dividend increases, Home Depot nevertheless pays a higher yield and arguably has more growth potential ahead of it. Let's look more closely at Home Depot to see how likely it is that the home-improvement retailer will give investors a dividend boost in 2016. A six-year streak of increasing dividends every year isn't all that impressive, but Home Depot has a long history of dividend growth. Unlike some companies that become almost obsessed with sustaining a span of consecutive annual dividend increases, Home Depot hasn't hesitated to take a pause in boosting its dividend when circumstances warrant. For instance, the most recent flat period occurred following the housing bust in the late 2000s, when the financial crisis made it hard to get access to cash and put a premium on keeping cash flow for internal growth. Similarly, the company went a couple of years from late 1999 to late 2001 without a dividend increase, matching up with the tech bust in 2000 and its impact on the overall economy. Recently, though, Home Depot's dividend growth has accelerated. The company raised its payout by more than 25% earlier this year, on the heels of a 20%-plus dividend increase in early 2014 and a boost of more than a third in 2013. Home Depot's business success has made those huge dividend increases possible. Throughout the past several years, the home-improvement retailer has fired on all cylinders, taking advantage of the booming U.S. economy and the recovery in the housing market in particular. Home Depot's strategy has involved appealing not just to its traditional core customers looking for help in do-it-yourself home projects but also to professional contractors doing jobs for their clients. Embracing its e-commerce channel has also led to surprising gains for the company, as Home Depot has worked hard to overcome some of the natural disadvantages of having bulky products that are hard to transport and finding innovative solutions for getting those projects to customers in a variety of ways. The moves have brought strong traffic and large profits to Home Depot. Moreover, Home Depot has found other ways to be friendly to shareholders. The company recently announced that it expects to spend $2 billion on stock repurchases during the fourth quarter, bringing its total annual buyback activity to $7 billion for 2015. The only real criticism of Home Depot's dividend is that its yield is relatively small at 1.8%. That's well below many of its peers among the Dow Jones Industrials. But it's higher than what Lowe's currently pays, and the fact that Home Depot's share price has risen at a greater than 30% annual clip over the past five years would make it difficult for any dividend to keep up. When will Home Depot's dividends rise again? With Home Depot having seen earnings rise at about a 17% growth rate so far in 2015, shareholders can expect another substantial dividend increase in the near future. The company has made a habit of announcing its rising payouts along with its full-year results each February, and a boost to somewhere around $0.70 to $0.75 per share on a quarterly basis would be consistent with its recent past practice. Dividends have only been a small part of Home Depot's success, but investors can expect further growth on the payout front well into the future.